A group of Axis residents worked with Nicholas Smith, engineer, to develope a rural water system, financed by FHA. The system was incorporated April 19, 1971, serving 150 members (customers) with one well and one ground level tank. Le Moyne is an unincorporated community in Mobile County, Alabama. 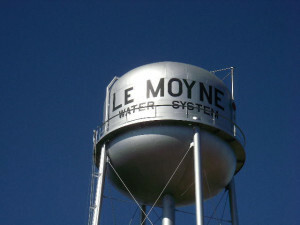 It was named in honor of the Le Moyne brothers, Pierre Le Moyne d’Iberville and Jean-Baptiste Le Moyne, Sieur de Bienville, founders of colonial Mobile. Twenty-Seven Mile Bluff, on the Mobile River, is located in Le Moyne. The bluff is the site of the former Fort Louis de La Louisiane, the first capital of French Louisiana from 1702 until 1711. The system is governed by a five member board, elected by members. The day to day operations are handled by Larry T Parker, system manager/cert operator, Rob B McDonald, asst cert operator/maintance and Marsha A Martin, billing clerk/ sec-treas for the board. The system now serves 1259 members with three wells and three tanks. Lemoyne is located in Mobile County. Its name is in honor of a tribe of Indians, the Maubila tribe. As of 2011, its population was 415,704. Its county seat is Mobile, Alabama.